The United Nations Humanitarian Air Service (UNHAS) getting ready to deliver aid. A lack of funding in Sudan could have serious repercussions on the ground, the World Food Programme (WFP) said today, warning that the United Nations Humanitarian Air Service, which serves as a vital aid link in the country, needs nearly $10 million to remain operational. Speaking at a press conference in Geneva today, WFP spokesperson Bettina Luescher said that, without the necessary financial assistance, the Programme’s ability to deliver food assistance to millions of people in the region, as well as to provide the air transportation that enables aid workers to reach them, could be seriously compromised. The ongoing conflict in Darfur, which has entered its twelfth year, has caused humanitarian needs in the region to be alarmingly high, with millions of conflict-affected people requiring food assistance and other humanitarian aid. 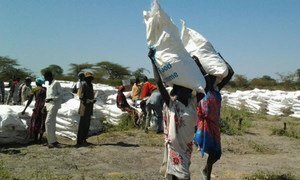 The WFP currently provides food assistance to the people of Sudan and also runs the UN Humanitarian Air Service (UNHAS). From January to June 2015, WFP flew 20,000 aid workers to areas that were previously unreachable by other means. Ms. Luescher said the Service is underfunded and without $9.9 million in financial support, it will have to close down by the end of this month. WFP is urging donors to come forward to make sure the people in Darfur and other regions can continue to receive the assistance they need. Without the Service, people will suffer, said Ms. Luescher, noting that in 2015 alone, WFP has helped three million people in the region receive badly needed food assistance. UNHAS currently provides essential humanitarian passenger services to several countries, including Afghanistan, Chad, Central Africa Republic, Democratic Republic of Congo (DRC), Ethiopia, Mali, Mauritania, Niger, Somalia/Kenya, South Sudan, Sudan and Yemen. In response to the Ebola outbreak, it also launched an operation to support the humanitarian response in West Africa.